It is crazy to think we go back even further than that day (my freshman year). And even more crazy to think I married that charming boy 5 years later. December is special to me because this was the time my husband asked me to be his girlfriend. What happened four days later, makes it even more remarkable...but I'll save that for another post. 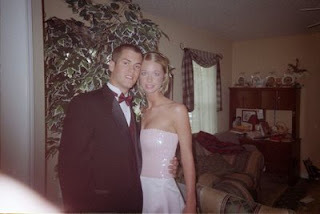 :) In the meantime, here are some oldie-goldie pictures of us at prom..
love the pictures! I've been to Myrtle Beach once... cute story. I love your blog. You're so funny! Take care. What shall we do with her? "Christ was born a martyr"
"Can I come too, daddy?"